The forecast 20 knots blew most of the day. The others needed for the downwinder to Cape Kimberly bailed so we couldn't do the tour, but 4 mile was on fire. Some headed for Cooktown, but there was plenty of good wind at 4 mile. Got on the water about 10:30 after resting from the morning bike ride. The wind was strong and consistent. Zee from Melbourne had arrived at 4 mile for the first time so I gave him sone tips and he launched my kite. The 14m kite was lit up so I de powered it to make the ride easier. There was a turtle feeding behind the reef. I saw it 4 times. Each time as I got closer it dived when it saw me. The last time I was heading straight at it and our eyeballs met. I got lofted on a direction time and landed on my arse on the reef, but my harness took the impact without me getting injured. Turning from left tack to right tack is a less fluid than from right to left. I tend to stall the board and then dive the kite to get going. Not good when over the reef. One big jump landed heavily, but my harness and vest cushioned my impact on the water. Jumping ok on both sides now. 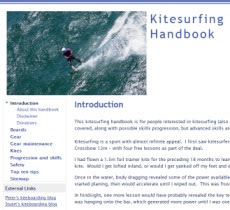 I tried my first kite down turn - it generated a lot more power and pulled me forwards. Lee advised letting the board slip downwind to maintain control. I did some reasonable toe down riding on both right and left (harder) tacks for practice. It is nice to carve a fast turn from the toe down position. I worked upwind behind the surf break into flat water on the shallow reef. The disadvantage is that you end up over the reef and have to be careful. It is also where the turtle was hanging out. I got right upwind towards the Mowbray River mouth too, then wakestyled downwind back to the main beach. I had a break after an hour or so and grabbed some food and my SLR camera from the flat. Took some photos of the kiting and around 4 mile beach. I kited for another 1.5 hours after lunch but my GPS batteries gave out so I did not get the full log. My numbness in the hands was not so bad today. I varied the grip a bit and shook it out while riding. I finished around 4:00pm which coincided with the wind dropping below 20 knots and packed away the kite on the grass. The fabric of the kite now has a crazed appearance - I will check this out when I get back. All in all a very consistent wind day and excelling kiting, with some skills progression and good jumping. 4 mile at its best. Peter, what equipment are you using to have such detailed tracking of your sessions? 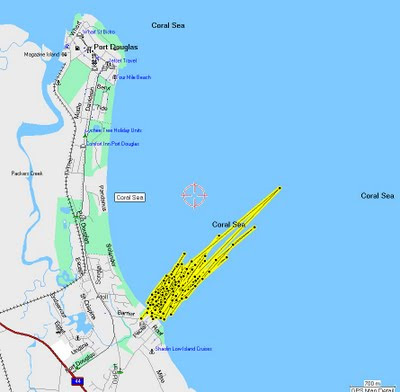 Gabe, I am using a Garmin Foretrex 101 GPS for logging most of my kiting sessions. I keep it in a waterproof gear bag. I will put up some more specific information about this. There is also a GPS designed specifically for wind and kitesurfing which is used for verifying speed attempts. I will put up some info on it too.